← Join Us Sunday, March 27th at the Jamestown Vintage Flea Market in Tustin, CA. 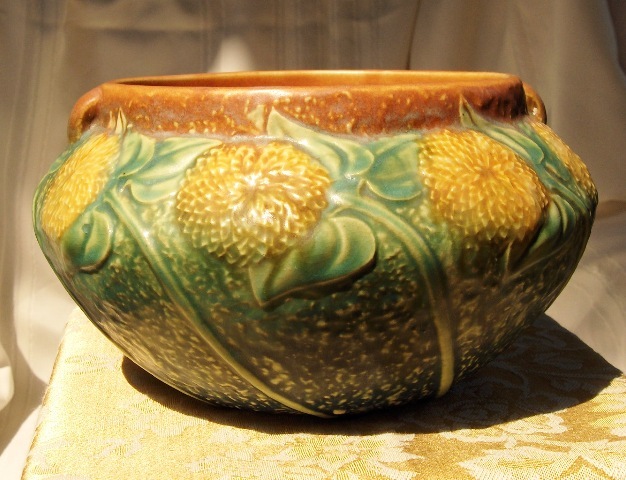 For those of you that are regular readers of this blog, my love for Roseville pottery is well-known. In fact I even admitted in a July 11, 2010 post that I was a Rookwood and Roseville snob. 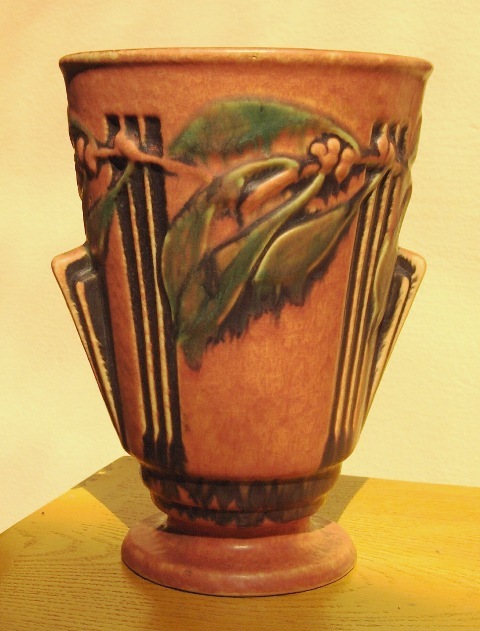 Roseville was my first pottery purchase and to this day, I am still amazed at the incredible artistic range produced by the company in its sixty-four year history. 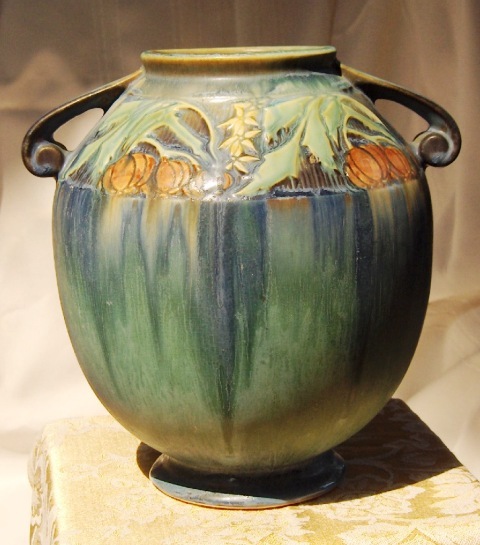 (1890-1954) Even now as a dealer I am frequently tempted to add a piece of Roseville to our personal collection. When I look at the creative arc in Roseville’s history from the classic styling of patterns such as Donatello, Volpato and Carnelian in the teens all the way to the modernistic Mid-Century designs found in Capri, Mayfair and Artwood, I see a distinct progression that mirrored the cultural and design scene in 20th Century America. 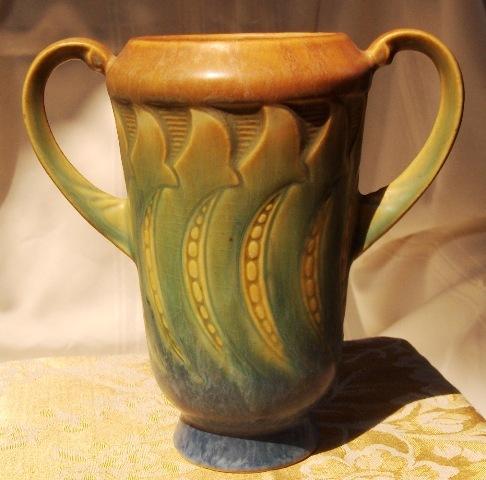 In my overview of the work, like many collectors, I am drawn to many of the patterns issued during the 1930’s. 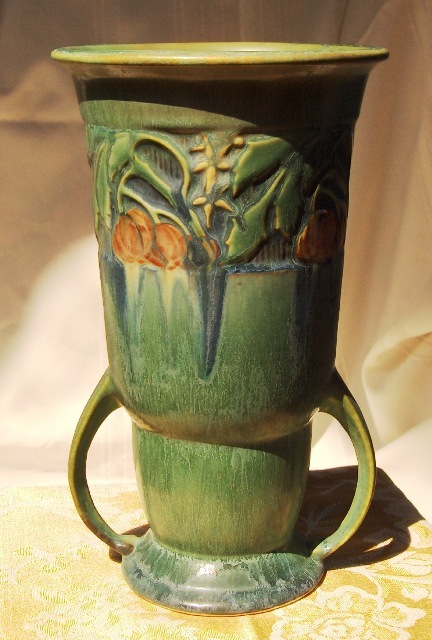 In the span of ten years Roseville issued ceramic items from such treasured lines as Blackberry, Baneda, Cosmos, Falline, Ferella, Fuchsia, Jonquil, Laurel, Morning Glory, Moss, Poppy, Primrose and all-time most popular line, Pinecone. When one examines the progression of the product design we see in 1930 in Earlam, a stripped down utilitarian series of vases, pots and candle holders. 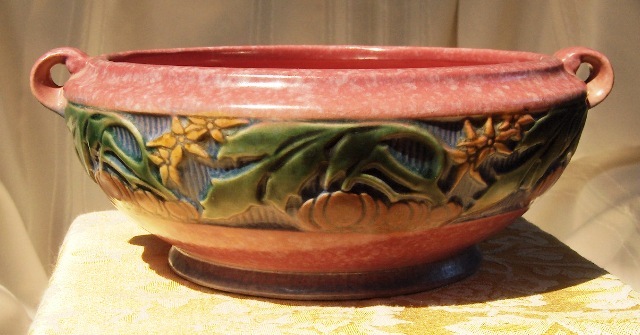 In 1931-32 we find a blending of the classic pottery forms and decorations with the floral depictions Roseville become synonymous with in Jonquil and Cherry Blossom. This period is important as I feel it became a reference point for the later floral patterns issued during the World War II era and beyond. During this decade America was in the throes of the Great Depression. 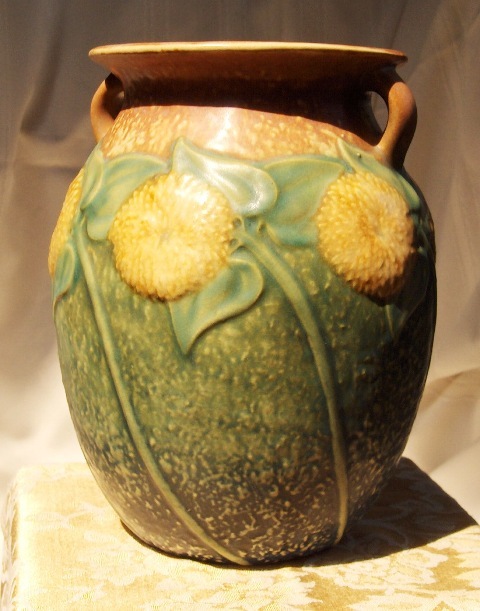 Life in America carried an uncertainty and it sparked a diversity in creativity which was echoed in many aspects of life including production of pottery at Roseville. In 1934-36 we saw the release of Art Deco inspired patterns such as Moderne and Laurel intersected by the realistic design of Pinecone in 1935 with handles in the form of branches joined to a pinecone with green pine needles. A simplistic design that through its popularity wound up saving Roseville from bankruptcy. The later part of the decade saw a mixture of emotion displayed in the stark variance of say the romanticism in Moss to the playful and joyous Primrose that to this day makes me think of a smiley face. In 1938 with Poppy we saw the flower become the focus of the vessel with its stems and leaves fading into the background. All of these touches to the human heart endeared Roseville to the masses and in my opinion cemented its importance in 20th century America pottery. This ability to change and expand its artistic statement along with the times gave it a universal appeal that invites collectors of all ages and demographics. This is not to say that the patterns issued during the 1930’s are superior to those of early or later years but rather it was the progression of adjusting its image in a very turbulent decade that sparks a lasting interest and demand. 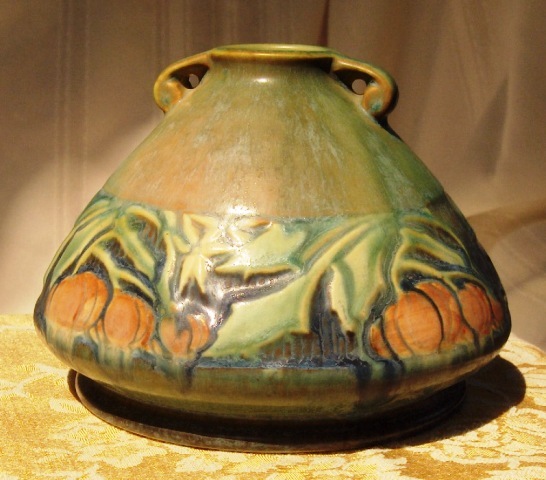 Billy Blue Eye is pleased to offer a recently acquired collection of vases from the 1930’s including examples from Baneda, Sunflower, Laurel and Falline. All eight of these vases are in excellent condition with no or minimal crazing and no previous repairs or production imperfections. Due to the limited availability of these treasures we invite interested collectors to contact us directly at billyblueeye@cox.net or at 949-496-1889 (Pacific Time Zone, 9AM to 8PM please) and if still available, may be viewed on Sunday, April 17th at the Long Beach Antique & Collectible Market. We accept Visa, Master Card, and Pay Pal and all orders over $200.00 are shipped free. Private viewings can be arranged for local collectors.